The John Lewis Partnership is one of the UK's leading retail groups, operating a national network of department stores under the John Lewis name, as well as supermarket chain Waitrose and a small collection of other businesses. Uniquely among major UK retailers, the company remains a mutual partnership, jointly owned by around 85,500 permanent staff. With a nationwide reputation for fairly priced quality goods, John Lewis is generally regarded as the preferred home goods retailer for the British middle classes, and both brands traditionally top any survey of the country's "best-loved" retailers. In recent years the group has enjoyed reasonably strong financial performance, and has expanded its Waitrose business considerably through the purchase of outlets from other chains. However, turmoil within the UK grocery market and competition from online retailers have weighed on performance since 2015, even as the group overtook key rival Marks & Spencer by market share. Who handles advertising? Click here for Agency Account Assignments. Adbrands Daily Update 7th Mar 2019: Tough trading during 2018 and over the holiday season left a sizeable dent on the John Lewis Partnership's results for the year ending 2019. Topline remained solid with net revenues of £10.3bn, up 1%. However bottom line was hard hit, especially at the John Lewis department store business, where operating profit plunged by more than half. That was partly offset by a strong recovery at supermarket division Waitrose, but the net result was that the group cut its bonus payout to partners (what it calls its staff) to the lowest level since 1953. Waitrose now accounts for almost two-thirds of revenues and more than two-thirds of profits. Adbrands Social Media 20th Nov 2018: "Fast Forward". Ooh, that's cheeky! And so very "meta" too. As part of the seasonal campaign for supermarket Waitrose - which is of course the sister retail chain to John Lewis - Adam&Eve DDB makes fun of its own latest John Lewis Christmas ad and the annual anticipation for each year's release. The concept underlying all the agency's seasonal ads for Waitrose this year is that the produce is so good, people can't wait to try it. And not even our beloved Lord Elton can stop them. Adbrands Weekly Update 15th Nov 2018: Ads Of The Week: "A Boy & His Piano". Well here we are. 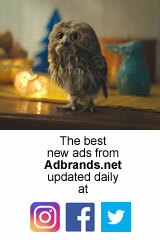 That annual Christmas milestone has been reached: the new John Lewis - sorry, John Lewis & Partners - ad is out. At first glance, Adam&Eve DDB has proved the doubters wrong. After last year's surprise disappointment, the 2018 Christmas ad is pretty damn wonderful: a celebration of the joy of giving while also providing some form of meditation on one of this country's most beloved musical icons, now just about to embark on his UK Farewell tour. We said 'at first glance' only because we suspect this ad won't look quite as original once the forthcoming 'Rocket Man' biopic is released next summer. There's a different cast and crew for the ad, so it's all original footage, not a clips compilation or promotional tie-in; nevertheless, the similarities are striking. But our Elton is clearly in the mood for some nostalgic reflection just now, and Adam&Eve DDB has managed to strike while the iron is hot. That rumoured (but denied) £5m paycheck probably helped too. All those reservations aside, this is a great film; a worthy successor to previous showstoppers from this retailer and its agency. It's ads like this that justify the fevered anticipation for each year's John Lewis Christmas ad. Adbrands Weekly Update 28th Jun 2018: British department store and groceries retailer John Lewis Partnership issued a warning that profits for the half year would be "close to zero" and the full year "substantially lower" as a result of the triple whammy of Brexit worries, competition from Amazon, and also fierce competition on price from struggling department store rivals House of Fraser and Debenhams. "It is widely acknowledged that the retail sector is going through a period of generational change," said Partnership chairman Charlie Mayfield, "and every retailer's response will be different. For the Partnership, the focus is on greater differentiation, not scale. [Size alone offers] less opportunity and less value than it once did. Difference is the only way to add value for customers." As a result, JLP's two main retail brands will rebrand as John Lewis & Partners and Waitrose & Partners respectively to highlight the group's unique status as a business collectively owned by its full-time staff, and both will invest heavily in even higher standards of customer service, to mark out the biggest point of difference from key competitor Amazon. John Lewis is one of the UK's best-known retail brands, a chain of 35 department stores spread across the country, selling a wide variety of private label and third-party apparel, as well as soft furnishings, consumer electronics and appliances and other goods. Its biggest stores also have their own food hall, and there is also a small group of 12 separate John Lewis At Home specialist stores, mainly located within shopping centres and selling only appliances and electronics. Until comparatively recently, several stores outside London operated under different names. Almost all of these have been converted to the John Lewis brand. The sole exception is now Peter Jones in Sloane Square, London. Knight & Lee near Portsmouth was replaced in 2012 by a newly constructed John Lewis store. Until recently, all stores were within the UK. The first non-UK outlet opened in Dublin in 2011. Long established as a regular haunt for middle class shoppers, John Lewis is famous for its "Never knowingly undersold" guarantee. Traditionally, the store promised to match the price of any cheaper retailer for any goods it sold. Fierce competition from online sellers forced the group to adapt this policy in 2006, when e-commerce retailers were excluded from that guarantee. In 2007 the group further restricted the guarantee so that it applied only to goods sold within an eight-mile radius of an existing store so that the price "will always be as low as the lowest price in the neighbourhood". Gradually though it has returned to its original promise, dropping the eight-mile restriction in 2009, and then expanding it to cover online rivals from 2011. John Lewis has around 19% share of the UK department store sector, and regularly tops rankings as the UK's favourite store. It also offers a fast-growing e-commerce service. This was opened up for delivery to Europe and other international markets during 2011, and now contributes 28% of total sales. For the year ending January 2019, John Lewis department stores reported net sales (ex VAT) of £3.89bn, up less than 1%. Operating profits before Partnership bonuses plunged by more than half to £114.7m. One unsual by-product of the fondness of the British public for John Lewis has been the extraordinary attention devoted to its annual Christmas advertising campaign, which has become quite disproportionate to the company's size. The first John Lewis Christmas ad was launched in 2007, in which a collection of different household items were arranged in a pile to cast a shadow on the wall behind that appeared to show a woman standing in the snow with her dog. London agency Adam & Eve was appointed to the account in 2009 and has been responsible for each ad since then, with increasing degrees of acclaim. "The Long Wait" from 2011 - in which a boy eagerly anticipates Christmas present-giving, but for an unexpected reason - cemented the popular appeal of the annual John Lewis ad. Subsequent hits include 2012's "Snowman's Journey", and especially 2014's "Monty The Penguin". Waitrose is the group's supermarket division, comprising a chain of 355 mostly medium-sized stores around the UK. The chain has expanded considerably in recent years, having acquired a number of outlets from Safeway, Somerfield and Morrisons. This allowed it to move out of its traditional core market of South-West England. It is currently the UK's 7th largest grocer, having been overtaken in 2015 by Aldi. Its share of the UK grocery market reached an all-time high in Oct 2016 of 5.4% (52 weeks to 9th Oct, Kantar), reflecting the fierce competitive pressure in the sector as a whole. Waitrose was one of the main beneficiaries of a shift away from the "Big Four" national supermarkets. In 2009 Waitrose moved for the first time into the convenience store market, opening a number of smaller stores to compete with M&S Simply Food outlets and the convenience outlets of Sainsbury and Tesco. There are now 65 such outlets as well as around 27 motorway service station outlets in partnership with Shell and Welcome Break. There is also a strategic alliance with Boots, which operates pharmacy concessions in some Waitrose supermarkets. In an extension of that arrangement, Boots stocks selected Waitrose food products. Although considerably smaller in size than the country's big four supermarkets, Waitrose is known for the quality and freshness of its food and especially for its organic produce. It was the first supermarket in the UK to sell organic food, in 1983, and now has a disproportionately high 18% share of the UK organic foods market. Reinforcing its prestige position, the store recruited two of the UK's most celebrated cooks, Delia Smith and Heston Blumenthal as brand ambassadors during 2010. Delia Smith has since retired, but Blumenthal continues to work with the chain, primarily on limited edition desserts for special occasions and holidays. Stores sells a broad variety of fresh and packaged food and drink comprising private label as well as national brands, and a small selection of household staples. In price terms, it is positioned towards the top end of the market, closer in spirit to Marks & Spencer than to Morrisons. Waitrose also offers two home shopping alternatives. Ocado is an independent service, but it offers groceries and other goods sourced from Waitrose stores. It originally had a significant shareholding in this independent business, but transferred its 29% stake in 2008 to the John Lewis Partnership employees' pension fund. Waitrose renewed its partnership with Ocado for a further ten years in 2010. However, Waitrose also offers its own Waitrose Delivers service from selected stores. After several years of strong financial growth, Waitrose has been dented by the turmoil within the UK grocery market since 2014. It gradually found its feet and performance has recovered somewhat since 2017. For the year ending January 2019, net sales (ex VAT) rose 1% to £6.43bn, while operating profit before Partnership bonuses and exceptional items climbed 18% to £203m. The group produces a large proportion of the furnishings, fabrics and curtains it sells at John Lewis at its own mill, Herbert Parkinson, acquired in 1953. However other manufacturing businesses have been sold off to management or other suppliers. Much of the fresh produce sold by Waitrose is sourced from the company's own farm, the Leckford Estate, which covers 4,000 acres in Hampshire. A more recent addition to the Partnership's portfolio was Greenbee, an online service introduced in 2006 which offered a range of selected products and services mainly in travel, leisure and financial services in conjunction with third party suppliers including AXA, Friends Provident, Expedia, Cox & Kings and See Tickets. Take-up of the service was limited and in 2010 the Greenbee brand was terminated. Instead the group continues to offer insurance services under the John Lewis name. The group transferred management of its long-standing John Lewis account customer scheme to HSBC in 2004, and subsequently replaced the old charge account with a new MasterCard credit card, the Partnership Card. The company is virtually unique among large commercial organisations in the UK in that it adheres to a strict constitution originally devised by its founder as an "experiment in industrial democracy". The business is jointly owned by its 85,500 permanent employees, who are known as partners. There are no outside shareholders, and partners are rewarded with a wide range of social and financial benefits including a generous profit-share scheme. For the year to Jan 2018, gross sales including VAT rose 2% to £11.60bn, with net revenues up by the same amount to £10.20bn. Profit before Partnership bonuses, tax and exceptionals has remained under intense pressure, falling by 22% to £289m, while profit before PB and tax plunged by 67% to £178m. Those figures included a number of accounting charges relating to pension deficit as well as restructuring and redundancy costs and impairments. Each partner received a tax-free bonus equivalent to 5% of salary (down from 15% four years earlier), making a combined payout of £74m. However, that was the lowest such dividend paid by the group for more than 60 years, reflecting the fierce competition in the UK retail sector. The multiple challenges faced by the group in 2018 forced it to slash its bonus payout to the lowest level for 66 years at 3% of salary, or a total of £45m. Topline remained resilient. Gross sales were £11.7bn, with revenues of £10.3bn. However profit before bonuses, tax and exceptionals plunged to just £160m. Profit before tax was £117.4m. Sir Charlie Mayfield is chairman of the John Lewis Partnership. (He was knighted in summer 2013 for services to industry). He has announced plans to depart the group in 2020. No successor has yet been named. Other senior managers at group level now include Patrick Lewis (finance director) and Tom Athron (group development director). Paula Nickolds replaced Andy Street as managing director of John Lewis in Jan 2017, becoming the first woman to lead that business. (Street went into politics, becoming Mayor of the West Midlands). Other senior executives at John Lewis include Dino Rocos (operations director) and Ed Connolly (interim trading director). The marketing team is headed by Craig Inglis (customer director), supported by Becky Brock (marketing director), Sarah Coleman (head of marketing, brand & social), Emma Wood (senior marketing manager, fashion & beauty), Catriona Barr (senior marketing manager), Victoria Drummond (senior marketing manager) and Katie Gould, Holly Kicul, Kirsty Traill (marketing managers, brand). Mark Price announced his resignation as managing director of Waitrose from early 2016 to become a government minister for trade & development. He was succeeded by retail director Rob Collins, who was in turn replaced by Ben Stimson. Marketing director Rupert Thomas replaced Mark Williamson as commercial director in early 2017; Martin George was appointed as customer director. Other marketers include Rupert Ellwood (head of marketing) and Natalie Mitchell (head of brand development). Having served his apprenticeship, John Lewis opened a draper's shop in London's Oxford Street in 1864, and gradually built up the business into a substantial department store, annexing the premises of neighbouring retailers and taking full advantage of the booming economy of the Victorian era. In 1905, he also acquired control of a rival store in Sloane Square, Chelsea, after the death of its own founder, Peter Jones. At around the same time, John Lewis was joined in the business by his sons, John Spedan Lewis and Oswald Lewis. (Spedan's unconventional name was chosen in tribute to John Lewis's beloved aunt, Anne Speed). A radical thinker for his time, John Spedan Lewis became increasingly uncomfortable with the knowledge that the annual salary he and his family enjoyed was equal to the total sum paid to the entire workforce at both the stores they owned. During the two-year convalescence that followed a riding accident, Spedan mulled over the social injustices of the age and vowed to do something about them. Upon returning to work, he began to establish new democratic methods and better working conditions within the stores, setting up a staff committees to advise on the running of the business. These and other radical ideas, such as a proposal to offer employees shorter working days as well as an third week of paid annual holiday, led to growing tension within the family. In 1914, John Lewis Sr removed Spedan from the management board of the main store in Oxford Street, but gave him instead full control over Peter Jones, then still making large losses. Spedan promptly introduced all of his radical methods in his new domain. Despite the economic Depression of the early 1920s, these slowly began to deliver results, and he was able to return Peter Jones to profit by the mid 1920s, at which point he introduced a new scheme to share those profits among staff. In 1925, Spedan also introduced a promise to customers that Peter Jones would never be knowingly undersold, guaranteeing to refund the difference if a customer could find the same item for less elsewhere. Younger brother Oswald sold his shareholding in the business to Spedan in 1925. Following their father's death in 1928, John Spedan Lewis inherited control of both stores, and set about taking the next step in his transformation of the business by introducing a revolutionary new ownership structure. He transferred full ownership of the business to a trust, distributing part of the equity in the business among the group's employees. He also devised a constitution which, then as now, decreed the key operating principles for the business. The most significant of these decreed that the ultimate purpose of the new John Lewis Partnership was "the happiness of all its members through their worthwhile and satisfying employment in a successful business", sharing "the responsibilities of ownership as well as its rewards - profit, knowledge and power". During the 1930s the business expanded considerably, first by acquiring its first store outside London, Jessop & Son of Nottingham, and then with the purchase of Waitrose. This was a chain of 10 small grocer's shops, originally established in London in 1904 by Wallace Waite, Arthur Rose and David Taylor, under the name Waite, Rose & Taylor. (Taylor left a few years later and the company adopted the abbreviation Waitrose in 1908). In 1940, John Lewis established a regional network for the first time with the purchase of another 15 department stores around the country previously controlled by rival group Selfridges. These included Trewins of Watford, Heelas of Reading, Robert Sayle in Cambridge, Cole Brothers of Sheffield and others. Spedan Lewis retired from the business in 1955, gifting his remaining shares in the business as well as his country estate in Leckford, Hampshire to the Partnership. He died in 1963. Management of the group transferred to Bernard Miller and then in the early 1970s to Spedan's nephew Peter Lewis. Both men continued the expansion of the group's operations, introducing the first Waitrose supermarket in 1955 and building its network through the establishment of new stores. The group's unique ownership structure has remained intact ever since its introduction by Spedan Lewis. In the late 1990s, after a sharp fall in profitability, there were calls from some partners to demutualise the business and float it as a public company. However no members of the group's guiding council supported the idea and it was abandoned.